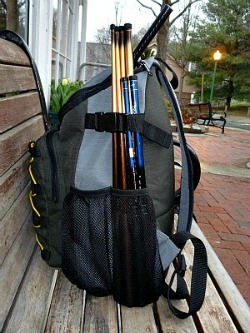 Please note: I no longer carry the Daiwa Kiyose SF rods. I have replaced them with the very similar but newer Daiwa Keiyu-X rods. The Daiwa Kiyose is sold in Japan as a rod to keep in a travel bag or daypack for fishing mountain streams, lakes or even the ocean. It is particularly well suited for people who want a light weight, compact rod for backpacking. Not long after tenkara was introduced into the US it became pretty clear that tenkara and backpacking go together very well. Tenkara rods are light weight, they collapse to a manageable length, and best of all, they do away with the reel - the heaviest and bulkiest part of a backpacker's fishing kit. Fortunately for ultralight backpackers, for whom a meal of fresh fish on the trail provides not only needed calories and protein but also a welcome relief from freeze-dried food, there are rods that are particularly well suited their needs. Considering its light weight (2.4 ounces), compact size (15.6" collapsed), effectiveness and modest cost, you'll have a hard time finding a rod better suited for backpacking than the Daiwa Kiyose 33SF. 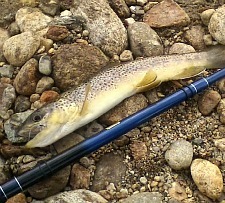 The 26 inch brown trout below was caught with a Kiyose 33SF using 6X tippet. The Daiwa designers did a masterful job in creating a rod that not only has the backbone to handle larger fish, but also the ability to do it while still protecting a light tippet. 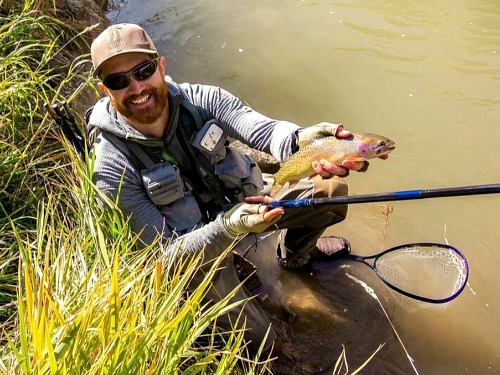 With a relatively short line, you can dance a CDC & Elk across the pockets of a headwaters stream, drift an Adams alongside an undercut bank or twitch a sakasa kebari through a plunge pool. You can fish it just the same way you would fish any tenkara rod. 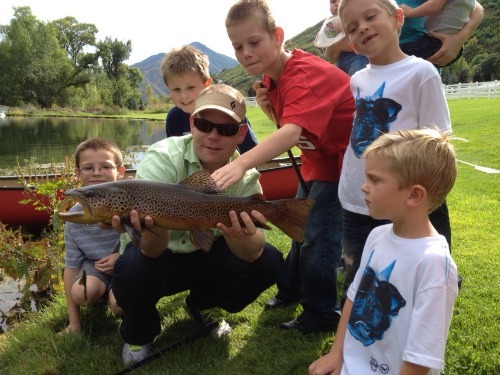 And just because they can handle a 26 inch brown, don't think it isn't any fun to catch more modest fish. An 8 incher will still put a bend in the rod. The Kiyose 30SF, with a pair of Fuji EZ Keepers attached as shown in the photo above, will fit in the Small Rod Case. 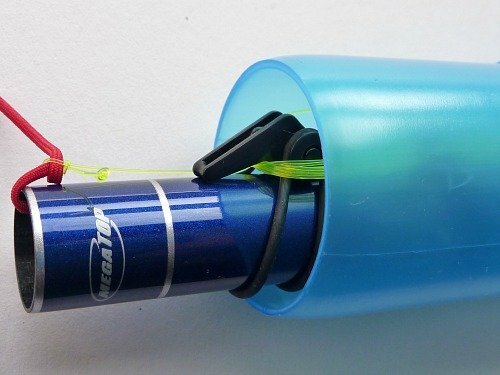 You can keep the fully rigged rod in your backpack and the case keeps other things in your pack from getting caught in the attached line, while at the same time protecting the rod and. It doesn't get much more convenient than that. It's not just a backpacking rod, though. The rod really shines when you tie on a bulky hopper or a heavy beadhead nymph - things people want to do with tenkara rods, but tenkara rods don't do particularly well. There has been a bit of a discussion recently about a tenkara rod as a tool and tenkara as a method. Tenkara rods and techniques evolved together over hundreds of years. Tenkara, the method, is generally considered to be fishing a single unweighted wet fly. Tenkara rods, the tools, are superb for that purpose. The further you get from a single unweighted wet fly, though, the less superb a tenkara rod becomes. About the same time that American anglers decided tenkara rods would be great for backpacking, they also decided they would be great for Czech nymphing. After all, even though Czech nymphing is done with a rod and reel, the reel is only used to store all the line you don't need when Czech nymphing. 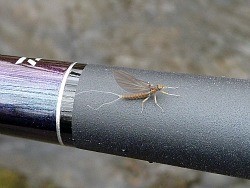 On the surface, it would seem that a tenkara rod would be ideal. As it turns out, on the surface a tenkara rod really is ideal, but near the bottom, where you are fishing your Czech nymphs, not so much. Just as a longer rod is a benefit in tenkara fishing, it is also a benefit in Euronymphing (any of the Czech, Polish, Spanish, French styles). Euronymphers now routinely use 10' rods. There is more to a Euronymphing rod than 10' and a reel seat, though. I once asked Aaron Jasper, who has made a name for himself in Euronymphing and has a couple Euronymphing DVDs out, if he had ever tried a tenkara rod. He said he had but didn't like it for Euronymphing. It was too soft. I was not at all surprised by his answer, as I had already come to the same conclusion. There are people who use tenkara rods for Czech nymphing (and Spanish and French etc.) and who claim they work very well. 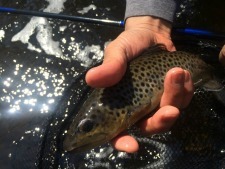 Certainly you can do it, but a couple heavy nymphs, particularly in strong current, are far enough away from a single wet fly fished just a few inches below the surface that a tenkara rod is no longer the best rod for the job. Please understand that the above comment does not in any way imply that any particular tenkara rod is likely to break when it is used for the purpose for which it was designed. It was meant to imply - no, to directly state - that tenkara rods were not designed for fishing heavy flies, with or without heavy current. 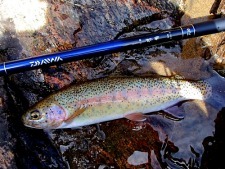 The Daiwa Kiyose SF rods are stiffer than traditional tenkara rods and notably have a stiffer tip section. They are thus a better choice for fishing heavy nymphs. Brown trout caught with the Daiwa Kiyose 30SF on a large, very heavily weighted fly. People don't talk about it much, but long rods are great for fishing streamers (or bucktails or buggers). I suspect the main reason they don't talk about it much is because it isn't done in Japan. Is there that much difference between pulsing a streamer and pulsing a kebari? That all depends on how big your streamer is and how deep you fish it. If you "huck big ugly streamers" like Erik Ostrander does, then yes, there is a difference - a big difference. First, there is a substantial difference in the water resistance you get from a size 12 soft hackled kebari and a big ugly streamer. Plus, if you add any weight at all to your bugger or sculpin to get it down where the lunkers lurk, you are going to need a rod with a stiffer tip and midsection than you'll find on any tenkara rod. The Daiwa Kiyose SF series has the stiffness tip you'd need - not only to manipulate your streamer or bugger or sculpin but to set the hook when it gets hit. There's no point discovering a fun way to fish a fixed line rod if it can't handle the hook set. I've seen one tenkara rod break on a hook set and know of others. They're not designed for fishing deep. Keiryu rods are. 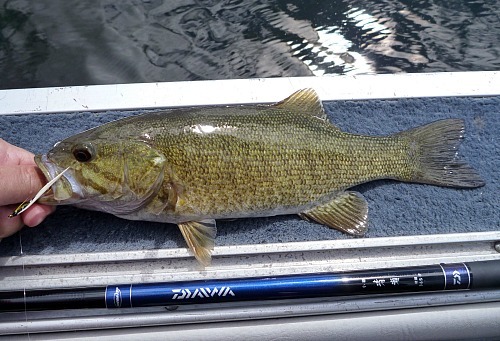 The first thing you'll notice about a Daiwa Kiyose SF rod, even before how good looking it is in the sunlight, is that the grip is relatively narrow and has no cork. I have now fished with a lot of tenkara rods, most with cork grips, a couple with wooden grips. I do not find the lack of cork or the narrow diameter to be any problem at all. I also use a more open grip. The 30SF rod weighs less than two ounces. It is so light that you don't need any cushioning and you don't have to hold it tightly. Plus it has a very effective non-skid coating. By the time you get up to the 42SF, the grip is no longer narrow. It gives you just about the grip you'd want for a big, beefy rod. Please note: Fuji EZ Keepers will not fit on the Daiwa Kiyose 39SF or 42SF. I would recommend a pair of the Small Tenkara Line Holders instead. Like the Daiwa high end tenkara rods, the Daiwa Kiyose SF has rings machined into the blank at the joints. 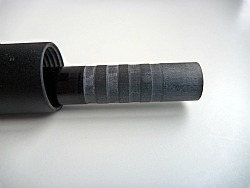 The "V Joint" as Daiwa calls it, serves two functions. It produces a smoother curve over the length of the rod, reducing the hard spots where there are two layers of tubing at the joints. Perhaps more important, though, the V Joint significantly reduces the chances of getting a stuck section. It really does! I received a comment from an angler who had a Daiwa Kiyose SF rod and a Shimano Kozuka NT rod (since discontinued). He said the Kiyose was consistently much easier to collapse. 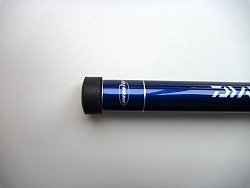 The Daiwa Kiyose SF has a rubber tip plug. 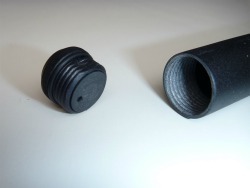 The Kiyose's tip plug does not have fluting, but it also does not have an extremely snug fit so you can still insert the plug with a level line still attached. As with all tenkara rods, you will have to watch the tip plug to make sure it doesn't get lost. If by chance it does, however, replacements are available. For that matter, replacement parts are available for any piece that happens to get lost or broken. All in all, the Daiwa Kiyose is a pretty unique and well thought out rod. Backpackers and nymph fishermen in particular will have a very hard time finding a rod better suited to their needs. And for an ultralight backpacker who primarily fishes heavy nymphs, there is no better rod. 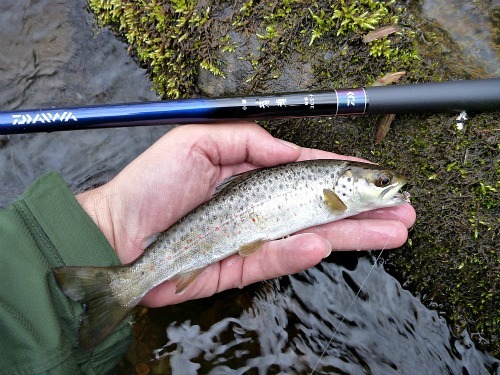 The Daiwa Kiyose SF rods have done more to shake up tenkara fishing in the US than any other rod. Just as tenkara rods encouraged fly fishermen to break the fly fishing mold, the Kiyose rods encouraged anglers to break the tenkara fishing mold. They don't have cork grips. They don't have soft, whippy tips. They do fish heavy nymphs very effectively and they easily handle the larger fish you catch when you fish deep. They made people realize that a rod doesn't have to fit the narrow definition a "tenkara" rod to be simple, fun and effective. Similarly, your fishing style (weighted nymphs or big bulky flies) doesn't have to fit within a purist's definition of tenkara to be simple, fun and effective. I finally got out to test the Kiyose. I tied on a 13' heavy tapered leader you made for me, and about 3 feet of 5x tippet. Used a small (size 12) parahopper, and a dark size 16 caddis and was surprised at how easily the rod allowed me to get the two flies out onto the water. It is an unexpected combination, being stiff enough to throw two flies well, and yet being incredibly light. I forgot my net (typical) and was worried that I'd have a hard time landing a fish, but the fears were unjustified. 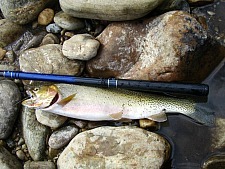 I caught a 15” and a 17” brown on the caddis, and an 18” rainbow on the hopper. All within 30 minutes. The rod worked flawlessly in fighting these larger fish. Thanks for selling me this "non-tenkara" rod. It's a real gem. I just got back from Vermont and the rod was great. I was able to fish all the small pocket water for pure wild Vermont mountain creek brook trout and had a blast, I lost count of the amount fish I caught. The rod is truly amazing. Can’t say enough about the 42SF ! I can definitely almost hook and heard small farm animals with that stick. What a joy to nymph with in larger rivers. Main advantage you have with this series, is the ability for hook sets confidently in runs over 3ft deep – which is a plus since some other Japanese rod Tenkara type models are softer in the upper 3 sections. This is fine for swinging and lighter nymphing – but when you have a cork indo – a split w/ tungsten – and a 3 fly rig on the Arkansas in Salida CO, the runs there are channelized, fast and can average 6 feet in some places. I have attached a photo from my Idaho trip in September. My estimate is that the rod in the photo caught over 400 trout since I bought it this past January. I keep a Diawa 36SF in my fishing daypack at all times because when the wind is howling or it is time to go deep, this rod has no equal. And I like how compact it is when collapsed. I just wanted to say how pleased I am with the Kiyose 33SF. It works just as advertised (how about that). Thanks for selling this item, along with the thorough explanation of its usefulness and features. Is it a tenkara rod? Ha, I don't think the trout are judging me. Keep up the good work. I love the Daiwa Kiyose 39SF! Having used much softer rods, I was surprised that the first fish I pulled in with it, a 14-inch Rainbow, was way more fun than I thought it would be on a 38 penny rod. My wife caught her first fish on a fly with it and now she’s “hooked,” too. It's almost unbelievable how effective nymphing with this rod is over a fly rod. Bluegill, rock bass, smallmouth, largemouth and trout; it's like picking carrots! The rod is extremely sensitive. I highly recommend the 39SF. It's light enough for one handed casting and great fun to fish. Oh, and it casts a size 4 fluoro level line very well if you can tear yourself away from weighted nymphs to fish wets and dries. The Diawa [33SF] is a very well thought out rod. It casts beautiful, looks great, I think the rings around each segment make so much difference in how smooth it casts. Small, looks great, only thing it's missing is a swivel on the tip, price is great, strong rod, best bang for the buck - hands down. For big rivers and big fish I like to use keiryu rods. My current favorites are the Daiwa 39SF, Daiwa 42SF, and Nissin 450ZX medium. I can chuck big flies and land big fish in high flows. I just wanted to thank you for your excellent service on my recent orders. Also, I wanted to give you a little product review on the Daiwa Kiyose 33SF, which I ordered some weeks back. Most of my fishing is with heavier nymphs in warm water. This past week I was able to take a couple of dozen bluegills (including at least one or two eight-inchers) from an area pond, plus a nice catfish. This rod makes an excellent nymphing stick, with just the right stiffness and backbone. It offered good hookset, while still allowing me plenty of fun with smaller-size, warm water fish. I think the Daiwa Kiyose is a great rod for the kind of fishing I do. I really like its build-quality as well. The 33SF is an excellent nymphing rod. Received delivery of kiyose 33sf, many thanks for the excellent service. Tried the rod out for an hour on a local river with some nymphs and caught a number of trout. Just the rod I have been looking for. Hadn't had much chance to use it to its full extent as some streams were too treed in and the rod too long or I was casting for distance…but today, well this river was perfect nymph water, with mostly clear overhead room. This little rod out fished a similarly rigged 2wt stream rod (not the best for nymphing) but the Kiyose clobbered 7 brown trout and lost a few more, with the other rod barely a bump or two but no hookups. I was fishing with a buddy who had a the western 2wt and we switched off. It seemed whomever was holding the Kiyose was catching fish while the other guy was getting casting practice. Nymphing aside, this rod was superior and I was surprised at how well and easily it handled fish even feisty ones.